Two years before Beatrice Prior made her choice, the sixteen-year-old son of Abnegation’s faction leader did the same. Tobias’s transfer to Dauntless is a chance to begin again. Here, he will not be called the name his parents gave him. Here, he will not let fear turn him into a cowering child. Newly christened “Four,” he discovers during initiation that he will succeed in Dauntless. Initiation is only the beginning, though; Four must claim his place in the Dauntless hierarchy. His decisions will affect future initiates as well as uncover secrets that could threaten his own future—and the future of the entire faction system. Two years later, Four is poised to take action, but the course is still unclear. The first new initiate who jumps into the net might change all that. With her, the way to righting their world might become clear. With her, it might become possible to be Tobias once again. From #1 New York Times bestselling author Veronica Roth comes a companion volume to the worldwide bestselling divergent series, told from the per-spective of the immensely popular character Tobias. The four pieces included here—The Transfer, The Initiate, The Son, and The Traitor—plus three additional exclusive scenes, give readers an electrifying glimpse into the history and heart of Tobias, and set the stage for the epic saga of the Divergent trilogy. Ever since I saw Divergent in theaters, I've wanted to get back into this world. Four is my favorite character of the series, so I was excited at the chance to explore his backstory. With the first story, we begin to understand just how hard Four's life was before becoming Dauntless. Four not only suffers physical abuse at the hands of his father, but he is also estranged from his entire faction. Lonely, desperate, and at his breaking point, he makes a choice in the Choosing Ceremony that changes his whole life. Each novella blends seamlessly into the next, so they read as one entire story. Each novella represents a layer of Four's character and as he tells each story, you see how he grows into the person Tris meets in Divergent. He struggles against every aspect of himself, trying to figure out who he is and who he wants to become. He isn't just a transfer or an initiate or a son or a traitor; he's all of these things and all of his choices. Four is an incredible character. After finishing the book, I was left with the feeling that it wasn't entirely necessary. I thoroughly enjoyed learning more about Four and it certainly added an extra depth to the Divergent story, but I don't believe I would've liked the series any less without these novellas. Fans of the Divergent series won't want to miss out on these companion stories that give a greater look into the choices that made Four the character many have grown to love. I absolutely loved this book! Everything was from Tobias' point of view! The Transfer was emotional as Tobias has to choose whether to remain in his faction of Abnegation under his father's cruelty or escape it by choosing another faction. In The Initiate we see Tobias adapt to life as a Dauntless in training with the help of Amar. In The Son, Tobias is officially a Dauntless and is suspicious of a conspiracy between Max, Eric and Jeanine Matthews. Also someone from his past resurfaces. The Traitor takes place halfway through Divergent from Tobias' point of view and it was amazing to see all of Tobias' emotions and feelings! They were also 3 additional short scenes at the end of this book making it absolutely amazing and perfect for fans of the Divergent series! 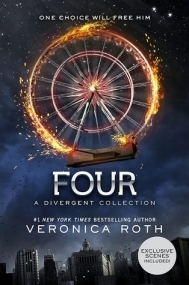 Starting two years before the events in Divergent, Four is a collection of stories detailing the life of Tobias aka Four as he made the same decision to transfer factions. There’s four short stories plus a few scenes from Divergent retold from Four’s POV included. Even though this was a collection of short stories, it still read, at least to me, like a complete book. Four went through the ups and downs, the growth, the self-discovery I would expect from a full novel. Four’s backstory was hinted at throughout the series but getting to read it gave a lot more insight into his character. The stories all took place before or during Divergent so this book was a prequel and there were no spoilers for Insurgent or Allegiant. It did make me want to re-read those books now that I feel like I have a new view on Four and see if my reaction to some of his actions have changed. Four’s voice in this collection felt a lot stronger than it did in Allegiant, maybe because the POV wasn’t shared or because this was 100% his story, his journey. There were appearances from a lot of favourite characters, Zeke and Shauna, and(not a favourite) Eric. It was nice to get the chance to see Four making friends and I loved the chance of getting to see Four from his own perspective again as opposed to solely through Tris’s eyes.